This resource was developed by the National Professional Development Center on ASD and contains 7 essential steps that can assists parents, educators, counsellors and therapists to implement successful FBA for a child with Autism. Often we assign "causes" to challenging behavior that are not helpful in finding a solution. Consider the teacher who explains to her colleagues that a student runs around the room because he has sensory issues. When asked how she knows he has sensory issues, she might respond, "I know because he runs around the room." This circular reasoning distracts the interventionist from identifying potentially useful information that might lead to an effective intervention. Functional Behavior Assessment (FBA) is a process rooted in the science of Applied Behavior Analysis (ABA), which focuses on the relationship between behavior and environmental variables. The ABA approach is empowering in that it places behavior within the context of day-to-day events that may be easily understood and potentially manipulated (Heward, 2005). Using an ABA approach in the above case, it might be useful, for example, to note that the child works for long periods of time without teacher attention or that he does not have the basic skills to perform the assigned educational tasks. Both pieces of information point directly to a potential solution to the challenging behavior (e.g., increasing teacher interaction, modifying the instructional task). Consider the utility of other terms (e.g., lazy, noncompliant, violent) that are commonly used to describe individuals exhibiting problem behavior. These vague terms have little value in the FBA process and, when applied, may result in blaming the person with problem behavior and ceasing the search for a true solution. 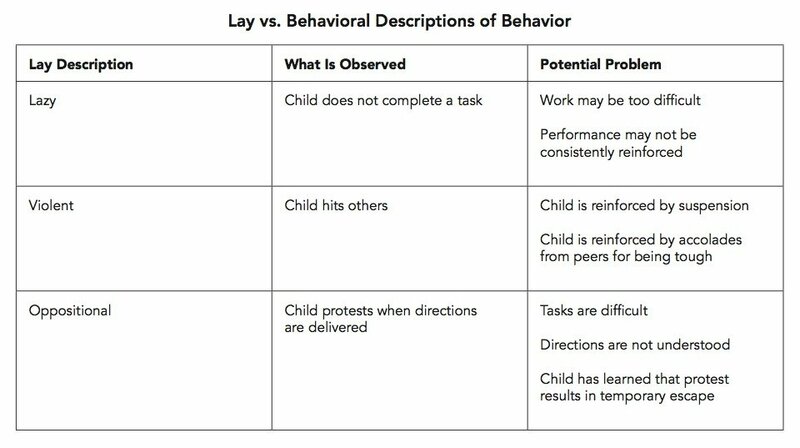 In the table above, we have provided other examples of lay terms that are often used to describe children, how those terms might be expressed using behavioral language, and potential environmental sources of the problem behavior. In functional behavior assessment, one focuses on how an individual uses problem behavior to navigate his/her environment or more specifically access or escape particular items, activities, or conditions. Behavior is observed within the context of the events that precede and follow it. Both of these variables play an important role in explaining why a particular behavior occurrs. This is a full checklist of 60 symptoms that indicates whether a person is Autistic or not.